Highly maneuverable, very safe, truly cost effective, and supremely efficient. Also, they incorporate an all-wheel hydrostatic drive system and, with larger wheels and increased ground clearance, it is also capable of operation on semi-rough terrain surfaces, making light work of tough conditions. 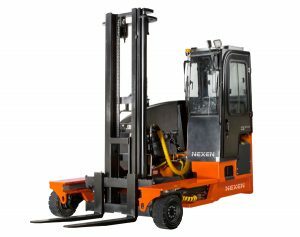 Why Choose a Multi-directional Forklift? Total Flexibility – Three Machines in One: “Counterbalance Forklift; Sideloader; Narrow Aisle Truck.” Suitable for use both inside and out, the multi-directional forklift can operate in aisles as narrow as 2 meters (80″).Robust construction provides maximum strength and reliability while its low profile platform design ensures optimum stability and safer product handling. If you’re interested in additional information on Sideloaders and or Multi-directional Forklifts and would like to request a quote, please use the form below to submit your request or contact your local KMH Representative at 888-564-7978.